Lower Normandy (called Basse-Normandie in French) is a former administrative Regions of France. It is now part of the region of Normandy. The capital city was Caen. In 2007 about 1.4 million people lived there. Lower Normandy became a region in 1956. The old region of Normandy was split into Lower Normandy and Upper Normandy. The departments in the region were Calvados, Manche, and Orne. The economy is centered on agriculture. Cider is made there and livestock is farmed. There is a bit of textile industry as well. It was the first region of France when it comes to producing butter, cheese and horses. The west part of the region is used mainly for farming, because of the prairies. 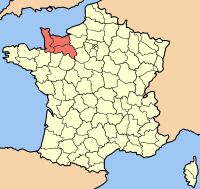 Camembert, Pont-l'évêque and Livarot cheeses come from this region. Wikimedia Commons has media related to Basse-Normandie. This page was last changed on 23 December 2017, at 23:16.